Schmuel ben Kevin v’hben Devorah celebrated his Bar Mitzvah on Saturday 24 October at the Sithans Centre. 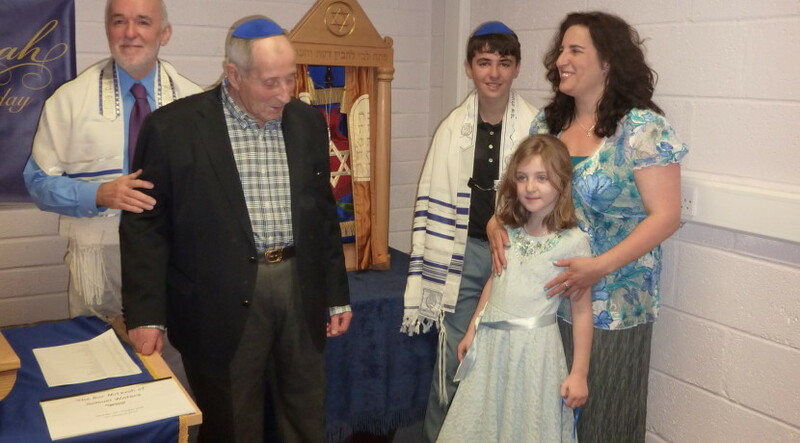 Over 80 members of his shul, family and friends were on hand to witness the joyous occasion. Sam’s read the maftir from the Torah passage of Lech Lecha on the 11th of Tevet using the historic Falmouth Scroll. It was the first time in over 135 years that a Bar Mitzvah boy has used this scroll. His grandfather, father, mother and uncles all participated in the services led by Kehillat Kernow Chairman, Harvey Kurzfield. A fine Kiddush followed – with extra-ordinary challot – and then a sumptuous lunch and celebration with dancing, singing and much merry-making. Mazel Tov to Sam and Todah Rabah to Kevin and Karen and Gerry. Have a look at the photos in the new photo album.